A spontaneous photo taken a moment ago after my computer's display went into "slide show" mode. I rarely use that old laptop and so the images it contains always catch me by surprise. 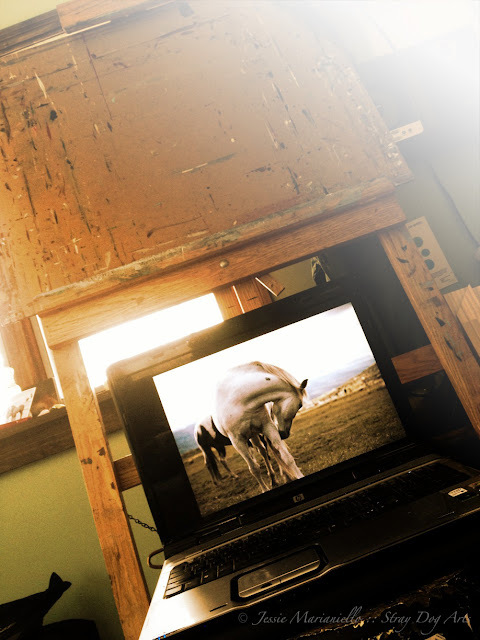 The computer happened to be sitting on a stool in front of the easel--an accidental magic space where it is easy to imagine the translation from photograph to painting. For the past two years I've been working on a series of large scale wild horse paintings that will eventually culminate into a solo exhibition, "Wild Horse Heart." I've gotten quiet about this project, gone a bit underground with it, because I am realizing that there is a lot of inner work going on as these paintings slowly come into being. I guess you could say that this is my Spirit Work. Looking at this image, my heart feels like it might leap out of my chest. I find myself needing to look away, if only for a moment. I walk across the room and look at it from far away because it feels easier. I love it when this happens. It is the feeling of joy, of expansiveness, of purpose. I continue to paint myself into being. Recording my journey along the way in the form of photos and words. Every day a new part of myself seems to unravel, to open, to unfurl. Already, I am looking forward to returning to the remote mountains of Wyoming this summer. To spend more time with those wild horses. To saturate myself in the wildness of my own heart.